This incredible four-post truck lift handles Class 8 - 9 trucks, buses and military craft. Extended-length vehicles have 8,204 mm of runway to work with, which is perfect for virtually everything in this weight class. Get ready to lift some massive vehicles. If you need a 15,876-kg. 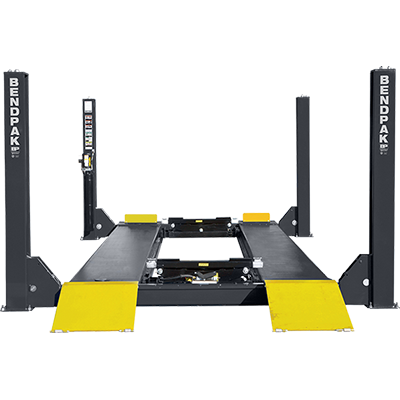 capacity truck lift with significantly extended runways, the HDS35X is just the ticket to smoothly handle wide wheel bases, extended dimensions and virtually every truck in this weight class. Roadside truck repair stations and full-sized commercial fleets want to be ready for virtually anything. Government contractors should consider this lift for military applications. Tanks and military transport vehicles are some of the most valuable machines in the world, and we're proud that our nation's private shops, as well as government entities, routinely trust the nation's finest with BendPak's best. Massive 8,204 mm runways are ideal for commercial fleets of all kinds. There aren't many semis or military land crafts that this lift can't accommodate. Most shops won't have a machine this size in the bay, so if trucks are in your wheelhouse, this car lift will set you apart from the rest. We put all our engineering prowess into keeping the HDS35X. After all, this is an incredibly heavy-duty lift, and on top of that, the runways are much longer than the ones on our standard-length model. To relieve pressure of the columns and ensure years of reliable lifting (decades, in many cases), BendPak utilizes 305 mm diameter cable sheaves with 102 mm axles. At that size, they're unlikely to wear out or ever need maintenance. Our heaviest-duty 305 mm x 305 mm base plates handle all 15,876-kg. of daily stress we expect you to put on this truck lift. Wider bases reduce stress put on the columns, and we promise to match the superior lifting power you need with the sturdiest structure money can buy. Auto-engaging locks click into place as the lift rises. All locks connect simultaneously, thanks to a built-in flow divider that moves the platforms evenly. With the push of a button, all locks release together for a safe descent. A secondary cable-slack detection system activates the moment slack is detected in the cables, safely stopping and locking the platforms in place until operators can figure out what's wrong. Of course, these failures are practically unheard of when lifts are properly used and maintained. We don't want here to be any question that the HDS35X offers best-in-class power and safety standards. Many other "top" brands don't even both with secondary safety locks, sadly. The RBJ25000 is an incredibly powerful bridge jack that lifts up to 11,340-kg. in just a few easy pumps. Massive trucks and commercial vehicles are often unbalanced—their centers of gravity aren't dead-center on the vehicles. We over-engineered this jack to ensure that operators can safely lift an entire semi-truck with just two jacks, without straining the jack, your back or dropping the truck.